The NAACP has joined with a couple and another man to sue the city of Myrtle Beach, S.C., and its Police Department over what they deem the discriminatory treatment of thousands of black motorcycling enthusiasts who descend on the city for “Black Bike Week” on Memorial Day weekend each year. As it happens, there are two motorcycle festivals held in Myrtle Beach during May. A week before the Atlantic Beach Bikefest, aka “Black Bike Week,” the city hosts the Harley-Davidson Spring Rally, aka “Bike Week,” which is primarily attended by white motorcycle clubs—those pillars of community not known for violence at all. According to the federal lawsuit (pdf) brought by Cedric and Leslie Stevenson of Suwanee, Ga., and Simuel Jones of Chicago, the city of Myrtle Beach institutes a strict and burdensome traffic plan (a one-way, 23-mile loop, taking traffic outside of the city and back) as well as a heavy police presence only during Bikefest. There are no traffic restrictions in place for Harley Week, although the two events are similar in size, scope and incidents, according to Anson Asaka, associate general counsel of the national NAACP and one of the attorneys in the lawsuit. Later during the festival, they left a restaurant without eating because they were afraid that they would get caught in the loop again and their fear of getting caught in the 23-mile route dictated their actions for the remainder of the festival, according to the lawsuit. The Stevensons were at the festival with Leslie Stevenson’s 70-year-old mother, and they did not want to leave her alone for an extended amount of time, so they decided to only go to restaurants and attractions that were within walking distance of their hotel. They “felt humiliated and frustrated” because the traffic loop forced them to restrict their activities. “The city’s efforts are having the exact effect they are intended to have: making African-American bikers feel harassed, humiliated and unwelcome,” the lawsuit says. Asaka, who says the NAACP has brought in legal, law enforcement and traffic experts to study and monitor both events, says that not only do businesses in Myrtle Beach close or charge higher prices during Black Bike Week, but the city also brings in hundreds of cops from all over the state during the Memorial Day weekend. “So you have a situation where you have a strong police presence at a large black event and with that comes more stops, more arrests, more harassment,” he says. The day after the NAACP brought its most recent lawsuit against the city and Police Department, Myrtle Beach Mayor Brenda Bethune said at a Feb. 28 City Council meeting that “public safety” was the city’s top priority, according to Myrtle Beach Online. In 2014, three men were killed in a shooting incident during Black Bike Week, but Myrtle Beach Police spokesman Capt. David Knipes said he could not confirm that the shootings were directly linked to the Bikefest. Asaka counters that the “public safety” argument is dubious at best. The AJC reports that when the NAACP sued the city in 2003 over a previous traffic plan for Bikefest, the U.S. District Court required the city to have the same traffic plans for Bikefest and Harley Week. That 2005 requirement expired in 2015, and when the new traffic plan was instituted for Bikefest, it was even more restrictive than the previous one. And yet according to a Myrtle Beach business owner (a gun-store owner at that), police let participants do what they will during Harley Week. 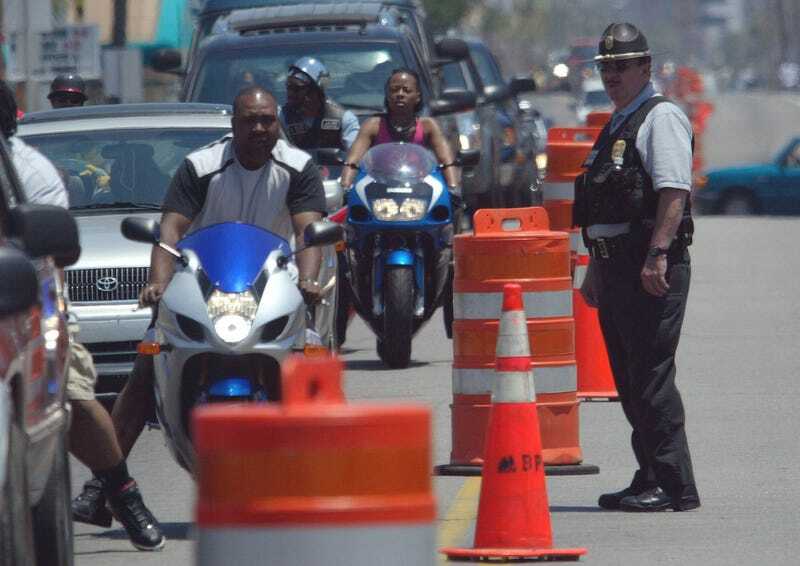 Black Bike Week is the one time of the year when the majority of the tourists in the city are African American, and it’s the one time the city has a one-way traffic pattern and a 23-mile traffic loop. They don’t have it during spring break, they don’t have it during the Fourth of July, they don’t have it during country music festivals or any other time they have major events in the city. “The whole intent is to discourage African Americans from attending Black Bike Week,” Asaka concludes. How Do I Upgrade My Hackintosh to Mac OS X Lion?